Posted October 25, 2018 by Town Hall Terrace & filed under Grand Island. 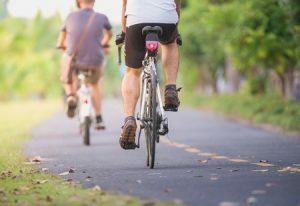 Following a lengthy and sometimes contentious development process, the 8-mile West River Shoreline Trail welcomed cyclists and pedestrians for the first time during its opening ceremony on Tuesday. The new multi-use trail connects Buckhorn Island State Park to Beaver Island State Park, and is part of larger trail system that stretches all the way from Lackawanna to Lewiston. The trail also offers year-round access to the Niagara River. Local residents who attended the opening ceremony expressed excitement about having a new, safe place to explore the Grand Island riverfront. After five years of development, attendees at the ceremony were eager to get out and enjoy the trail, even on a chilly day in October. Next year, Grand Island residents will have yet another new outdoor destination to enjoy when the Margery Gallogly Nature Sanctuary opens in the fall. At Town Hall Terrace, we also offer a variety of amenities for residents who want to maintain active, healthy lifestyles. From our fully-equipped fitness center to our tennis courts and heated pool, you can choose from a diverse selection of activities to enjoy. To learn more about these or any of the other amenities you can find at Town Hall Terrace, feel free to give us a call at (716) 773-2788 today!